strange..this family needs to 'rest' from all of this, the media attention etc..while we have another missing child, Jhessey Shockley whose grand mother would love all of the attention for her missing grand child..doesn't seem like this grandmother is resting while Jhessey is missing..she is doing every thing she can to get the word out about her missing grand child..
and, why haven't any of the grand parents of Lisa spoken out? no one really has have they??? strange is all I can say..
check this out ...from Justice for Lisa Irwin Facebook! I wouldn't put too much faith on the sightings. Some people think that all things are about them, and they can't wait to inject themselves on a big story, even if their testimony can put the case in jeopardy. Some people do it out of the willingness to help, and innocently concoct stories just because they are convinced they saw something. The times of the first sighting keep chancing. Some say 12:00am, some 12:15am, 12:30am, 12:35am, 1:15am, 1:30am, etc... The time discrepancies may have to do with who published the incident, the reporter who wrote down the story, and how each media outlet staff understood the story. The first sighting facts are something else. On October 4th, the woman gave many interviews and each of her recollections was about her husband coming home from work and seeing the man with the baby. She at no time claimed to have seen the event, she recalled what her husband had told her. Then in the latest interviews this woman is saying that both she and her husband saw the incident, and she gives details as if she saw it herself. She now says her husband was "going" to work, instead of coming home from work. The 2:15am "sighting" could be put to rest, because the surveillance picture is so bad that even if a kidnapper was caught in the video, he/she could not be identified. It's hard to tell if the image is from a man, woman, and whether the person is carrying a baby or not. The captions said he was seen coming out of the woods, but there are many homes in all the streets around the area, he could've been out for any reason. The 4:00am is also discountable. The gentleman claimed it was 45degrees that morning, when the temperature was quoted here being at around 60 degrees. The witness says he saw the man walking up Randolph Road, most possibly going North (Thompson said he exited on 48th St. coming South on Hwy 435). He was going West on the right lanes, the man walking up Randolph was on the other side of the road, so how well did he see the guy. Yet, he gave LE a description and identified the person on the sketch as Jersey. He reported the incident a week after, and he identified the man after Jersey was in custody. So, did he identify him as Jersey because he is convinced that Jersey has done it? There hasn't been ONE person who has come out and said something that speaks of truthfulness. Even with the new $100,000 reward nobody is coming forth. The economy is bad and a few people who know what happened should be spilling their guts about what happened, even if just for the money. Yet, nobody is coming forth. If I were LE, I may check all the alibis for the 24 hours BEFORE they reported Lisa missing. Up to the revelation that neighbor Maria watched the children when Debbie and her brother were at the store and ... up to the revelation that neighbor Maria was present when Debbie put baby Lisa to bed at 6:40 pm ... I embraced the theory that something bad happened in the hours prior to Jeremy leaving the residence for his workplace at 5:20 PM. I now contend that three witness cannot be wrong in regards to observations that took place at 12:15 PM and 04:00 PM ... observations that a male of the same stature and appearance of Jeremy was walking the streets in a T-shirt with an unclothed baby in his arms. Unless official confirmation is forthcoming which implies that Jeremy was at his workplace at the 2:15 AM and 04:00 AM sightings ... I cannot move on in my speculations. Until the truth is revealed ... speculation is where it is at. If I am wrong in my speculations that Debbie and Jeremy were participants in the demise and/or disappearance of baby Lisa ... I would eat an entire humble pie while rejoicing. I've been wondering about that 230 call,also wonder about the grand jury and if they will have parents arrested at some point. She may have been taking the pictures, and I agree, babies can wake up in the morning, or in the middle of the night with a high temp that was unexpected. I am not defending DB, I do not know if she was involved, but I can certainly understand her being mentally, physically, and emotionally exhausted. We are all different, and react differently. She may have been advised to take a few days of rest to recharge. I do get what you are saying, but I can't imagine a mother who wouldn't be doing everything publically to get her baby back. I'd risk going to jail forever because not finding my baby would be worse than that. Could it be that Debbie and Jeremy have seen the writing on the wall and ... that is the reason they are no longer speaking with the media and ... cancelled the media showing of their house and media conference scheduled for today. In other words ... exhaustion is not the issue. UNIDENTIFIED FEMALE: Is it true that you`re getting paid to avoid local reporters? Thanks to all for posting updates, insights, research and images. Somehow ... 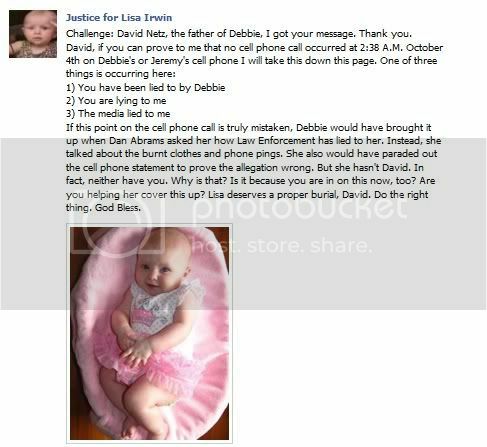 I believe that justice will prevail for baby Lisa. Coult it be that investigators are behind the scenes connecting the dots and ... arrests will be forthcoming? Thanks for editing my typos. I think the police said that they searched the area today because it's an area near Lisa's home that needed searching, but me thinks that it had to do more with the area being in the way to where mom bought he wine. The article says the area is near Festival Foods, and two miles from the Irwin home. So, does the police suspect that Lisa was disposed of while buying the wine? Kansas City police conducted the search in the area of Interstate 35 and Chouteau Trafficway near a Target store. The search concluded just before 1 p.m. and no new clues were found, police said. The area searched is just west of the Festival Foods where the missing baby's mother, Debbie Bradley, bought a box of wine and baby items just before 5 p.m. Oct. 3. Police said the search wasn't due to a tip and that it was an area near baby Lisa's home that needed to be checked off their list of sites to be searched. The search area is about two miles from the baby's home. Thing here is that they may not want her baby found. Why publish pictures of when the baby was 5 or 6 months for her posters, when there were more recent pictures available? Why not post her more recent pictures if they want a fast and correct identification from the public? All the procrastination having to do with what will happen if the baby is found. I'm guessing the interview will not happen. Page created in 1.762 seconds with 19 queries.